It’s the dish everyone’s expecting on the holidays, but it’s so easy to make, you can serve it any day. 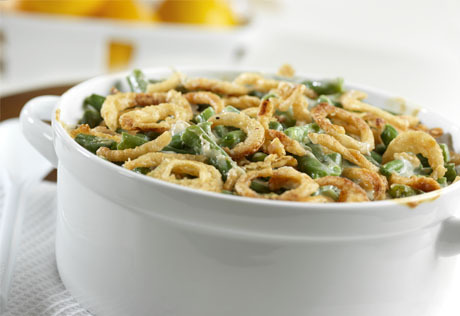 What makes our green bean casserole so good? A secret ingredient – cream of mushroom soup. Stir the soup, milk, soy sauce, bacon crumbles, black pepper, beans, diced red pepper, and 2/3 cup onions in a 1 1/2-quart casserole. Bake at 350°F. for 25 minutes or until the bean mixture is hot and bubbling. Stir the bean mixture. Sprinkle with the remaining onions.